"Kenny Barron has developed into a highly original creator of post bop jazz which is also reflected by the growing number of his compositions which a have achieved the status of jazz standards." Born in Philadelphia, Kenny Barron is a pianist, composer, and teacher, the brother of saxophonist Bill Barron. He began learning piano at the age of 12 from the sister of pianist Ray Bryant, and with the help of his brother secured an engagement when he was 15 with a rhythm-and-blues orchestra led by Mel Melvin. He played with Philly Joe Jones (1959) and Jimmy Heath, and in Detroit with Yusef Lateef (1960). In 1961 he moved to New York and began appearing regularly at the Five Spot with James Moody, on whose recommendation he was engaged by Dizzy Gillespie; he toured Europe and North America with Gillespie in 1962-66. He played briefly with Stanley Turrentine and belonged to several groups led by Freddie Hubbard (1967-69). By 1970 his compositions had been recorded by Gillespie, Hubbard, and Moody. he played again with Lateef from 1971 to 1975, except for a period in 1974 during which he belonged to Buddy Rich's sextet. From 1976 into the 1980s he played in a group led by Ron Carter and in the early 1980s was one of the founders of the group Sphere with saxophonist Charlie Rouse, bassist Buster Williams and drummer Ben Riley and finally set up his own trio and quintet. He also was Stan Getz's pianist during the last period of the great saxophonist's life. In 1973 he was appointed to the faculty of Rutgers University. 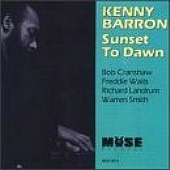 Barron is a reliable mainstream pianist, whose style has been influnced chiefly by Tommy Flanagan and Wynton Kelly. A selected discography of Kenny Barron albums. Green Chimneys, 1983, Criss Cross. Autumn In New York, 1984, Uptown. The Only One, 1990, Reservoir.